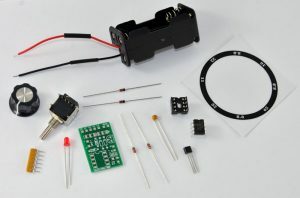 NOW OFFERING A DIY KIT! Click here for more info and instructions. Mastering the Land Camera Manually. Sometimes you just want more control over your shots than your Automatic Land Camera can provide. The aperture priority nature of the camera doesn’t give you much control when trying to do multiple exposures or shooting odd lighting situations. The only option is to find yourself a manual camera model like the 180 or 195. Which will not only be expensive, but so will keeping the shutter running properly with CLAs and repairs. Now there is a Manual Option! Either send your camera to me for modification or you may purchase an already complete and refurbished model. Available for all the Automatic Models 100 to 450 and every one in-between. The camera is given a whole new life as an electronically controlled manual camera. A rotating knob replaces the electric eye with 10 shutter speeds including BULB. An LED lights up to tell you the shutter is ready to fire and turns off when the exposure is complete. When using BULB mode, press the button once to open, press it again to close. No need to hold down the red shutter button anymore! Making long exposures much easier. All Manual Options have up to SIX aperture settings. Under or over exposed images or black photos? No problem! THIS CONVERSION CAN BE DONE EVEN ON MOST BROKEN CAMERAS. If you would like to try different colors for the front and top plates, let me know! Your Polaroid camera electronically converted to manual shutter controls! Unlike the mechanical models like 180/195, your camera will never need calibration. New custom front and top plates. X-sync modification of PC socket for electronic flashes. or purchase one of the COMPLETED TOP OF THE LINE MODELS! All cameras are modified metal body models. Every camera comes with a new user’s manual specifically created for this very camera! Includes everything above but with the addition of a holding case and your choice of various accessories. Contact me for more details about what is available and for pricing. Special Edition Gold lettering front and top plates.